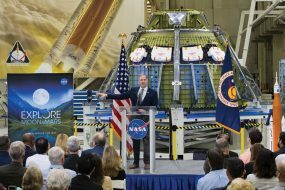 NASA has extended its Facilities Development and Operations Contract at the agency’s Johnson Space Center with Lockheed Martin Corp. This $340.6 million three-year extension includes a two-year base period and a one-year option. The extension base period runs from Oct. 1 through Sept. 30, 2016. If exercised, the additional one-year option carries the contract through Sept. 30, 2017. If all options are exercised, the estimated total contract value will be $1.3 billion. The cost-plus-award fee with baseline, level of effort, and indefinite delivery/indefinite quantity contract provides continued support development, operations, maintenance, and sustaining engineering to Johnson’s Mission Operations Directorate. This includes mission control, mission planning, reconfiguration, and training systems. The work will take place at or near the Johnson Space Center. FDOC supports all human spaceflight programs for NASA, including the International Space Station, Orion multi-purpose crew vehicle, and other programs that may be defined in the future.